Report manager is part of the PeopleSoft Process Scheduler and provides a framework for viewing output from processes (typically reports) based on the user's privileges. Reporting folders are used to store process output into specific groups (think folders or directories in a file system). Job definitions, process definitions or individual process runs (instances) can distribute to a specific report folder. Distribution can be either to specific operator ID or a role. Navigation for this setup is: PeopleTools -> Integration Broker -> Integration Setup -> Service Operations. This assumes that you have integration broker setup and working correctly. 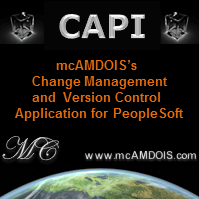 This change requires a restart of the application server to become effective. The applicatione engine program PRCSYSPURGE perform the purge of the Process Request and Report Manager tables. Despite the name convention, it is actually ReportDistAdmin that gives you access to other people's reports. By default the permission lists that give you access to the reporting pages include PTPT1000 and PTPT1200. PTPT1000 gives access to the report manager Administration page. PTPT1200 gives access to the List and Explorer pages within Report Manager.